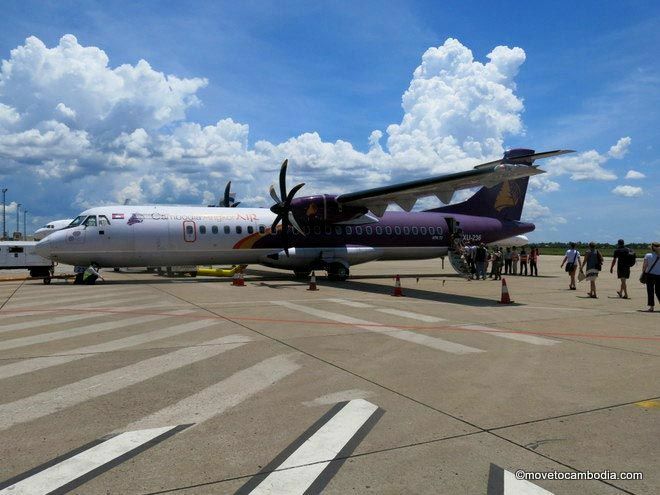 Cambodia Angkor Air flies ATR72s for the one-hour trip between Sihanoukville and Siem Reap. JC Airlines is a new airline offering, at the time of writing, daily flights between Siem Reap and Sihanoukville for around $100 to $120 round-trip. Read our review of JC Airlines (it’s a different route but you’ll get the idea). Giant Ibis has a great reputation for safety in Cambodia, and they’re going to be running night buses between Siem Reap and Sihanoukville for this coming high season. Giant Ibis uses two drivers for the Siem Reap-Phnom Penh leg of the trip to make sure they don’t have any sleepy drivers behind the wheel. The buses leave at 8:30 p.m. in either direction. Tickets cost $25 and can be purchased online in advance and allow for advance seat/bed reservations. Until these tickets are available, check out the Giant Ibis combo-trip below. There’s also a Virak Buntham night bus, which of all of the tourist buses in Cambodia has one of the worst reputations for accidents due to driver error. Although they are very popular, you couldn’t pay me to get onto one of these buses. 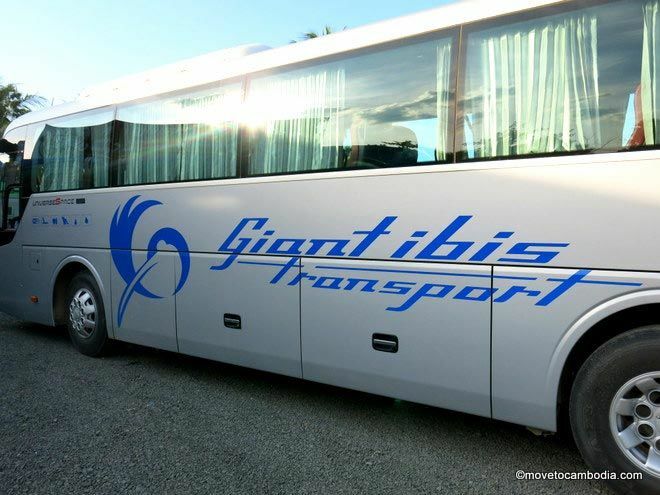 Giant Ibis is the expat pick for being the safest bus company in Cambodia. They don’t offer direct service between Siem Reap and Sihanoukville (to be fair, nobody else does either) but it’s an easy transfer at the Giant Ibis office just next to Phnom Penh’s night market. This is a full-size bus, but you’ll then transfer to a mini-bus for the Phnom Penh to Sihanoukville portion of the trip. Coming from Siem Reap, you can take the night bus which gets in around 6 a.m. 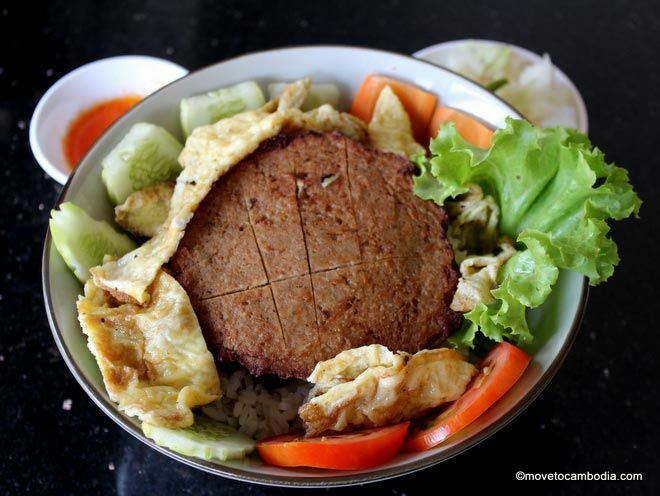 This gives you enough time to stretch your legs and get breakfast on Phnom Penh’s riverside (or join in the public aerobics, if you so choose) before getting on the second leg of the trip to Sihanoukville at 8 a.m. Going the other direction, the bus leaves Sihanoukville at 7 a.m. and arrives in Phnom Penh approximately four hours later, which is long enough for a quick lunch before the Phnom Penh to Siem Reap portion of the journey that leaves at 12:30 p.m. (and this bus stops several times, including for a meal). If you make a reservation online you can book the two legs as a joint ticket for $26 and reserve a seat in advance. Otherwise tickets are available at all local travel agents and guesthouses, but you will need to buy the two legs separately. Total travel time is 12 to 13 hours. Sihanoukville to Phnom Penh: 7:30 a.m., 9:30 a.m., 1:30 p.m. 3:30 p.m.
Phnom Penh to Siem Reap: 8:45 a.m., 9 a.m., 9:45 a.m., 12:30 p.m., 11 p.m., 11:30 p.m.
Siem Reap to Phnom Penh: 8:45 a.m., 9 a.m., 9:45 a.m., 12:30 p.m., 11 p.m., 11:30 p.m.
Phnom Penh to Sihanoukville: 8 a.m., 9:25 a.m., 9:30 a.m., 12:30 p.m.
Mekong Express offers the Phnom Penh to Siem Reap leg of the trip in a full-size bus (their full-size buses are junkers from Japan that are old but safe) and the Phnom Penh to Sihanoukville portion of the trip in a newer Ford or Toyota mini-van for a total of around 12 hours. Mekong Express has a reputation for safety and are a popular choice amongst expats. If you get your ticket online, you can get the two legs as a joint ticket and make a seat reservation in advance. Mey Hong is a mini-bus company that is more locally-oriented (ie. it’s not particularly well-known amongst tourists). They drive comfortable Ford mini-buses that are air-conditioned with seat belts. 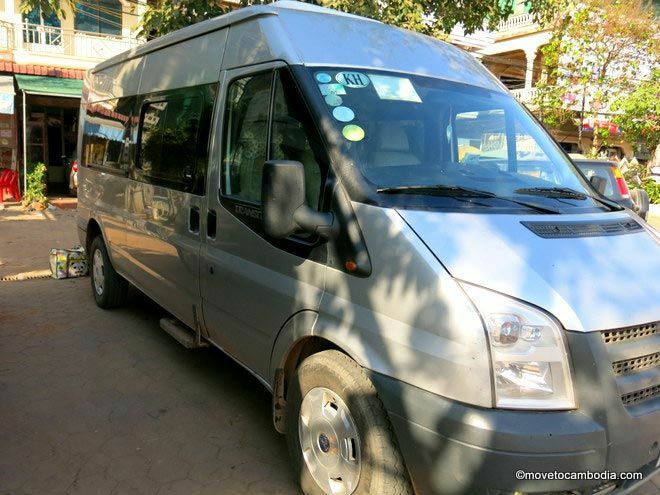 During high season they have mini-buses to go the Siem Reap to Sihanoukville route that connect in Phnom Penh with a one hour break. Total travel time is about 11 hours–they drive fast! Cost is $20 and tickets can be booked at any local travel agent or guesthouse. You can book tickets online in advance. Private taxis can be hired through any travel agent or guesthouse, we’ve used Best Beach Travel in Sihanoukville (T: 015 678 924). Be sure to confirm the price before the trip as misunderstandings happen more often than we’d like. If you want to avoid the hassle, you can make a reservation for a private taxi online in advance. Mini-van taxis that seat up to 15 people are also available and offer more room for people and baggage. The cost is usually a bit more than double the cost of a regular taxi, at the time of writing we were quoted $300. 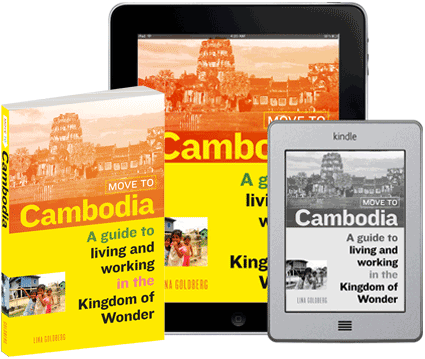 This entry was posted in Transportation, Sihanoukville and tagged Giant Ibis, Mekong Express, Mey Hong Transport, Cambodia taxi, Sihanoukville to Siem Reap, Siem Reap to Sihanoukville, Capitol Tours. Bookmark the permalink. Hey guys, thanks so much for all your helpful info on this site. I’m trying to book a night bus for me and 2 others but the 11:30pm option is only coming up with Virak Buntham not Ibis. Assuming the Giant Ibis is sold out already? I am booking for 2 weeks time so seems odd? That would be odd. I would use the chat function on BookMeBus and ask them. Hello, do you know anything about the website 12go.asia for buying bus tickets? Is it legit? You get a Flight for as low as 30$ with Bayon Airlines.